The Manu tribe voted out Aubry, a 32-year-old marketing director from Hampton Falls, NH, who currently resides in Los Angeles, CA, and previously appeared on Survivor: Kaoh Rong and Survivor: Game Changers, through a 3-1 vote at Tribal Council on Night 13 of the game. The tribe thought they permanently ousted Aubry from the competition to win $1 million; however, Aubry decided to stay in the game and wait for an opportunity to possibly play again by traveling to Extinction Island. Wendy Diaz, a 25-year-old small business owner from Los Angeles, CA, who currently resides in Bell, CA, received one vote from Aubry at Tribal Council. At the start of the latest episode, the Manu tribe was comprised of Wendy; Aubry; Victoria Baamonde, a 23-year-old waitress from Bronx, NY; Gavin Whitson, a 23-year-old YMCA program director from Erwin, TN; and Eric Hafemann, a 34-year-old firefighter from Chicago, IL, who currently resides in Livermore, CA. Kama was made up of the following five original Kama members: Ron Clark, a 46-year-old teacher at Ron Clark Academy from Chocowinity, NC, who currently resides in Atlanta, GA; Julia Carter, a 24-year-old medical assistant from Hazleton, PA, who currently resides in Bethesda, MD; Aurora McCreary, a 32-year-old divorce lawyer from Pensacola, FL, who currently resides in Orlando, FL; Julie Rosenberg, a 46-year-old toy maker from Baltimore, MD, who currently resides in New York, NY; and Joe Anglim, a 29-year-old multimedia artist from Chandler, AZ, who currently resides in Ogden, UT, and previously appeared on Survivor: Worlds Apart and Survivor Cambodia: Second Chance. And Lesu had all former Manu members. It was comprised of Lauren O'Connell, a 21-year-old student at Baylor University from Bakersfield, CA, who currently resides in Waco, TX; Dan "The Wardog" DaSilva, a 38-year-old law student and former military man from Ossining, NY, who currently resides in Los Angeles, CA; David Wright, a 44-year-old television writer from Philadelphia, PA, who currently resides in Sherman Oaks, CA, and previously appeared on Survivor: Millennials vs. Gen-X; and Kelley Wentworth, a 31-year-old marketing manager from Ephrata, WA, who currently resides in Seattle, WA, and previously appeared on Survivor: San Juan Del Sur and Survivor Cambodia: Second Chance. The Survivor broadcast began on Day 12 with Rick Devens getting settled on Extinction Island. Although it was uncomfortable to try to live and thrive with his former fellow castaways who were glad to see he failed, Rick saw this experience as another way to test his fortitude and will in the game. It didn't seem like Rick had any desire to give up any time soon. The challenge required each tribe to race through a series of obstacles, collecting bolos along the way. The castaways then had to land those bolos on a target. The first two tribes to finish would win Reward in the form of sandwiches, milk, and peanut butter and jelly. The second tribe to finish would receive a small plate of PB&J. Aubry sat out for Manu and Julia sat out for Kama to even up the numbers. Kama won Reward in first place and then Manu placed second, leaving Lesu empty handed once again. David said the Lesu tribe had to think positively because it'd be their only way out of this. Kelley couldn't believe her tribe performed so terribly in challenges and she didn't know what to do because they couldn't win anything. Later that day, at Kama's camp, Julia said her tribe was "a force to be reckoned with in this game." They were "dominating" and happened to be on a winning streak. Julia, however, viewed Joe as a huge threat and wanted him out of the game sooner rather than later. Joe didn't know how to "shake that stigma" of being a "challenge beast," so he tried to provide for his tribe and help them out as much as possible so they wouldn't want to get rid of him. While Joe went out fishing in the ocean, his tribemates talked about potentially blindsiding him at camp. But Ron realized the tribe needed Joe for food and challenge wins, so he explained to his tribemates it might be too early to get rid of him. Joe admitted he'd be miserable at camp without Joe's assistance and they'd probably lose challenges going forward. Julie insisted they can survive without him and Ron just built a case for Joe as for why he should win the game. "If you don't get rid of returning players by the time the merge hits, they could end up running away with the whole thing. So if we end up losing immunity, Joe has to go now," Julie told the cameras. At Manu's camp, the tribe was very hungry despite having a few PB&J sandwiches and Victoria wanted to eat a chicken. Wendy was totally against killing the chickens, however, and Eric said working with Wendy would be like "carrying around an alarm clock but you have no clue when it's going to go off." But Eric acknowledged keeping returnees in the game was also dangerous. 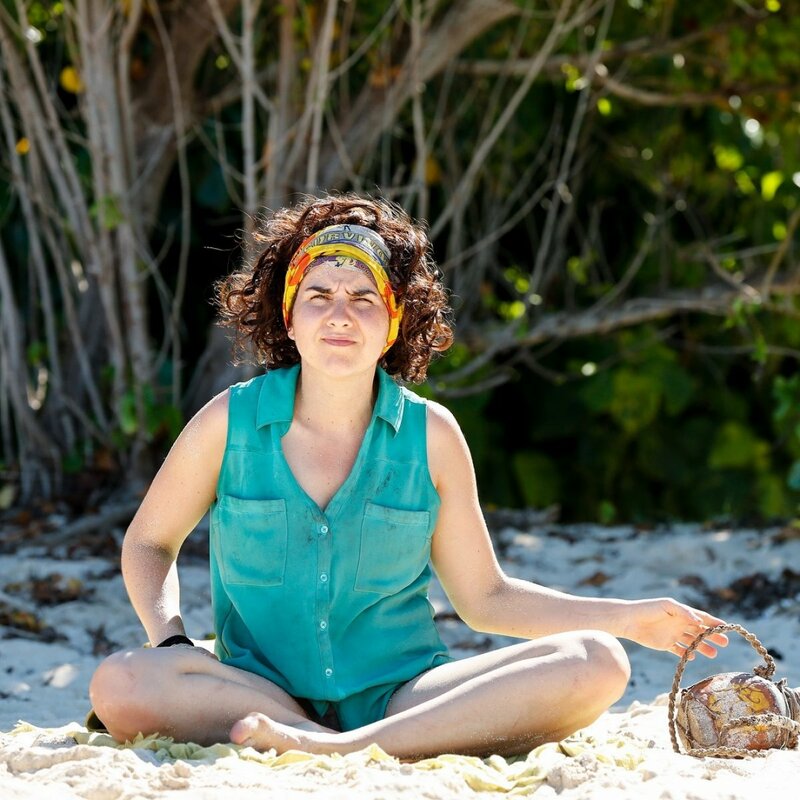 As for Aubry, she was frustrated no one in her tribe seemed to be strategizing. "I need to find someone who is going to wake up from the Kama cult Kool-Aid and do something about everything come the merge," Aubry said in a confessional. Aubry, however, was wrong because Victoria and Eric were strategists who were talking to Gavin about a gameplan. Victoria suggested to the guys she approach Aubry with plans of an all-female alliance so when they target her next, she'd never see it coming and would feel there is no reason to play her hidden Immunity Idol. Eric thought it would be a great diversion, and the group agreed they needed to get Wendy onboard as well. Victoria really liked Aubry as a friend and as a person, but she said she easily separated her feelings from the game and didn't really care about people's emotions out there. Victoria then pitched to Aubry the idea of teaming up with Wendy to take out "the big boys" one at a time. Aubry was psyched about the plan and said Victoria was "sneaky away the whole time." "Her glasses are big. Maybe I didn't see her eyes open," Aubry noted. Over at Lesu's camp on Day 12, David joked his tribe was on the edge of extinction and he'd probably be the next person to go. David therefore realized it was "critical" to find a hidden Immunity Idol and he had to shake his insecurities in this game. He was "never going to give up in this game." Lauren was still sick, but she was convinced Wardog and Kelley were both on her side and she had an idol. As a result, David truly was the tribe's target. Wardog then spoke to Kelley about how Lauren hurt their game a little bit because either the girls would team up and take him out eventually or Wardog and Lauren could work together to take Kelley out. Kelley acknowledged Wardog had "a little crazy" in him and reminded her a bit of former Survivor winner Tony Vlachos. Wardog insisted they should vote out Lauren right away. Kelley had a great relationship with Lauren, but she figured she could trust Wardog and continue working with him going forward. Kelley said it's "kill or be killed" and she might just have to take out her best friend in the game in order to get ahead. On Day 13 at the Edge of Extinction, Chris Underwood found a box on the beach with scrolls inside. The scrolls were a map that basically presented the castaways with a puzzle. They had to align the stars on the edges of the paper and then fold it a certain way to reveal the location of where they must go. The map revealed two trees of interest, and although Rick figured out the puzzle, Keith Sowell took off looking for the food or whatever might be waiting for them without any of his fellow castaways. Rick, Chris and Reem Daly were pissed and admitted that's exactly why they voted Keith out to begin with. Chris, however, managed to get to the tree before Keith and discovered three wooden rods with string attached as well as a note that read "Practice." At the other tree, Rick found an advantage in which he can reward one player in the game an extra vote at the next Tribal Council. The twist was interesting considering none of the players in the original game even knew Extinction Island existed. Rick said it was a wakeup call they were on the Edge of Extinction but they weren't out of the game. Meanwhile, the three tribes met Jeff for the season's next Immunity Challenge. Each tribe was required to swim out to a ramp, race up and leap off, dive down to retrieve puzzle pieces and then pull their pontoon with rope to the finish and use those pieces to build a buoy pyramid. The first two tribes to finish would win immunity. Kama sat out Julie to even up the numbers, while Manu had Victoria sit out. Lesu struggled so much during the diving portion of the challenge that Probst said "it might be one of the biggest blowouts in Survivor history." Lesu hadn't even collected their puzzle pieces while the other two tribes were already solving the puzzle. Kelley was "in despair," according to Probst, as she watched another challenge "slipping away." Kama finished the challenge in first place, and in a shocking turn of events, Lesu came up from behind and crushed the puzzle so they finished in second place! Kelley was thrilled and called her tribe "the comeback kids." Meanwhile, Victoria was plotting "a big move" for Manu. After the challenge, the original four Kama -- Aubry, Victoria, Eric and Gavin -- came together and agreed on the plan of taking out Wendy. But Aubry still had Victoria's pitch in the back of her mind of keeping the women together. Aubry knew Eric would be a threat at the merge so she considered taking their hit at him now since Wendy was still available to use as an opportunity. Aubry, however, soon found out it was difficult to get an opinion or even a straight answer out of Wendy. Even though the women would have the numbers, Aubry feared what it would be like to work with Wendy for the rest of the game. Suddenly, Aubry found an envelope in her bag and it was an advantage in the form of a second vote. Aubry didn't have to tell anyone about the second vote, and the last time she could use it is when only seven people are left in the game. The extra vote would also extend through a tie and a re-vote. Aubry wondered whether to use the vote now and knock out Eric or save it for after the merge once the "numbers get funky." Aubry didn't know "what the hell to do" with her "royal flush." Aubry was used to playing from behind, not being a power player. Aubry always felt she had to fight and be cautious in the game of Survivor, but she resigned herself to thinking something may finally go right and actually go her way. At Tribal Council that night, Aubry announced she had found a loyal, trustworthy ally in the game. But as she spoke of this person, Victoria was cracking up since she had been plotting to backstab Aubry all along. Gavin said he was basing his vote on the people he could trust and whom would benefit his game going forward. Aubry predicted this vote may be "simple" although she tends to overthink things. It then became time to vote and Probst eventually read them aloud in the following order: Aubry, Wendy, Aubry, and Aubry. Aubry was absolutely shocked and said, "You guys are unbelievable players. Wow! Damn! Holy sh-t!" She wished everyone luck on her way out and told them to "kill it." But then Aubry came across the signs pointing her in two directions. She called it "an easy decision" and "a no-brainer" to continue playing the game and head to Extinction Island.